The popular programme by Secuoya Contenidos will air this Friday the 24th of March at 8.00pm. Once again, Chim and Rebecca Stones head this popular home video and game show, this time introducing new segments and games. Hilarious videos, huge smiles and the coolest presenters now have a date fixed to return to the screens. 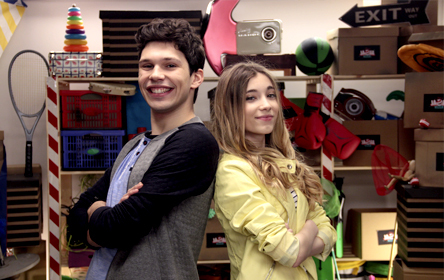 Disney Channel will launch the new season of “Jaja Show” on the 24th of March, at 8.00pm. This popular programme, produced by Secuoya Contenidos, is composed of home videos and games. Chim and Rebecca Stones return to present this Disney Channel programme, perfect for all the family, with new segments that will bring a smile to the face of all viewers. It will also feature the voices of Fernando Costilla and Paco Bravo, the voices behind well-known programmes such as “Humor Amarillo” and “WWE”. A group of cheeky children make up the team for this fun section of the show. Their mission? To play the most hilarious pranks. Don’t trust them…any minute now that could be playing one on you. “Rebeccavision” Our popular YouTubers now have their own in-house game, created in their image and likeness. An indecipherable image appears on the screen and they have to guess who it is. Chim and Rebecca compete to find out what hides behind the pixels. The image is always the first frame of a very funny video that we get to watch once the puzzle has been solved. If you never miss a trick, if you are like a hound on the chase, if you always have your eyes wide open…This is the category for you! Chim and Rebecca offer up a challenge. ”WANTED … look for a blue rubbish container, a yellow towel, a lost dog, a birthday cake…” The lost object can always be found within the videos in the programme. Will you be able to find it? We see the final moment of a video. A child covered in chocolate cake, a kite entangled in a tree? How did this happen? Of three possible options, the presenters have to guess the reason for the disastrous final images. Alongside these new sections, viewers will continue to enjoy the well-known classic games that make up the programme, such as “Don’t Laugh,” (No te rías) “There’s Trouble Brewing” (Se masca la tragedia),” “Sixty Crazy Seconds of Chim” (Los sesenta segundos locos de Chim), ”Don’t be disgusted” (Que no te de asco), and so on. In this new season, viewers can enjoy 40 new episodes that the channel offers, which will air at 8.00pm. Furthermore, followers of “Jaja Show” will have access to twenty new compilation programmes, featuring the best videos, which will air at the weekend. “Jaja Show” is not only a look into the funniest international videos, it is also the gateway to the world of Rebecca and Chim Stones. These two YouTubers, who are very popular among kids today, transmit fun and empathy every time they are in front of a camera. With their chaotic fun factory as the backdrop to their show, they both show that humour, friendship and having fun are the best ways to reach out to their viewers.